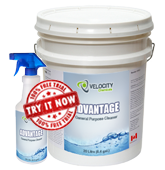 ADVANTAGE is a non-caustic, non-silicate, general purpose cleaner. It is used by transportation companies, breweries and in the aircraft, forestry, manufacturing, and pulp and paper industries to clean oils, gums, resins, and soils from sensitive metal and other surfaces. It is commonly used on paper machines, aircraft, floors, walls, windows, and painted and plastic surfaces. Pre-soaking – use from 40:1 to full strength, depending on soil conditions. Rinse with water.High-Pressure Washing and Steam Cleaning – use at 0.5% to 1%, depending on surface dirt and soil conditions. Rinse with water. Building Maintenance – use at 20:1 to 100:1, depending on soil conditions. Pail and Brush – dilute to 5:1 to 100:1. Brush in, let sit and rinse out. ADVANTAGE is safe on all metal and painted surfaces when used as directed.